Jacob Josefson has had a bumpy start to his NHL career with the New Jersey Devils — he has shown flashes of brilliance, but has also fallen victim to the injury ninja. Not just any injuries though, ones that last months rather than days or weeks. Now in his third season as a pro (2009 NHL Draft, 20th overall/74 career NHL games), he is hoping to solidify his spot as one of their key players as New Jersey pursues a return to the Stanley Cup Finals. He still has yet to crack the top two center spots on the Devils (currently behind Travis Zajac & Patrik Elias), but he is still a valuable contributor to the team, providing them with quality ice-time and is becoming better at winning face-offs. Even when Adam Henrique returns from injury, he will still likely be the third center, as Elias will slide back to his natural position on left wing. But he has also played time on the left wing of the top line in certain in-game situations. But stats don’t always show a players’ value — his coach Peter DeBoer has shown the utmost confidence in the 21-year-old Swede, using him on the PP and on the PK, as well as end of game situations. The coach’s confidence has not gotten past Josefson, who cracked a smile when asked about the responsibility (and trust) he has been given since DeBoer took over as head coach before the 2011-12 season. If he keeps making shifty plays like that he could be a key contributor for the Devils, not just this season, but for many more after. His teammates are hoping he can stay in the lineup and are aware of how valuable his contributions have been to the team when he is in there, especially the depth he gives them down the middle. 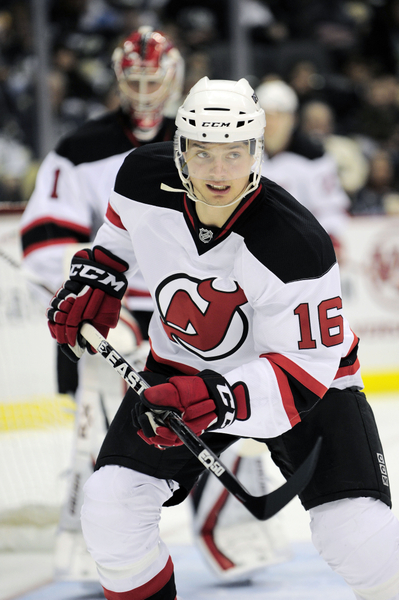 Most Devils fans like Josefson and his skill set and are intrigued by what they think he can bring to the team. In the back of their minds they also hope that he has bubble wrap under his uniform to prevent another bizarre injury that could stunt his development again.